Latest news: The Guardian has just posted this article with more details about those attending today's event. An extraordinary coalition of activists, business leaders and politicians meets in London today to call for comprehensive reform of the City of London Corporation. The newly created City Reform Group wants to radically overhaul the electoral processes of what is widely known as Britain's last rotten borough. CRG also requires a far higher standard of transparency of the Corporation's opaque and somewhat sinister finances, above all the so-called 'City Cash', which looks to outsiders like a slush fund for dodgy lobbying. 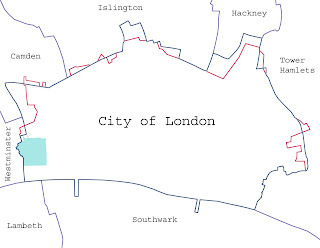 For those unfamilar with the political arrangements of Britain's state within a state, the City of London Corporation has survived for over a millenia, resisting each and every attempt at political reform, and using its financial and military muscle (yes, it still has its own militia and police force) to protect its special interests. Behind the veneer of medeival pageantry and grotesque flummery, however, lies a powerful set of vested interests, which sees its role as projecting an economic model of de-regulated finance and economic liberalism across the world. Read Ingrid Hauge Johansen's exposé of the extraordinary activities of the City's Lord Mayor, who carries the flag for this failed economic model to all corners of the globe. For a wider exploration of the City's historical background and unaccountable powers read the penultimate chapter of Nick Shaxson's fascinating book, Treasure Islands: Tax Havens and the Men Who Stole the World. If you have any doubts about the malignant power of the City and its political wing, this book will dispel them. The newly formed City Reform Group, which meets today at Spitalfields in the City centre, plans to push for reform from within the Corporation by securing pledges from candidates for the Corporation elections in March 2013 to promote a wide series of reforms. TJN supports the CRG's calls for reform, indeed we have been publicly calling for reform for several years and debated the need for reform with senior Corporation officials on the steps of Saint Paul's Cathedral. But we won't be holding our breath: too many of the voters (which includes banks and other financial businesses) have a vested interest in the status quo, and history tells us that the Corporation is perfectly capable of outliving those who oppose it. Reform won't come from within; it will need to be imposed by Parliament.